What size mast for my Hex? High frequency radio propagation is greatly influenced by sunspot cycles. The reason for this is that the upper ionosphere which reflects the HF radio waves and gives us the skip for DX, is especially energized by increased radiation from the sun during the sunspots. 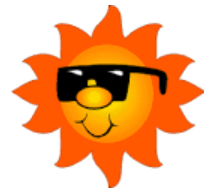 When there are a lot of sunspots, high frequency radio is hot! You can work the world on ten meters with 50 watts. But when sunspots are down, you can’t work much of anything on ten meters even with high power. There will still be good days but not as often as the bad days when we are in a down sunspot part of the cycle. The sunspot cycle is about 11 years and our most recent peak was about 2014-2015. So the good days for DX on the higher bands will be not as often for a few years. However, 20 meters is not as badly affected as ten by the down sunspot cycle. So you can use a hex for 20 and 17 while 12 and 10 are pretty dead. There are just more good days for 20 and 17 than for 12 and 10 meters. This means you have a chance to get a hexagonal beam at a lower price by just buying the lower frequency bands. Our hexagonal beam is built so that it is very easy to add other bands later. So use this time as an opportunity to try out a hex with a minimal financial commitment. Then, if you find the hex to be what you have heard and hoped, plan on adding more bands as the sunspot cycle turns up again. It will be sooner than you think because time flies when you are having fun with a KIO hexagonal beam! Previous Your Hex on 40? 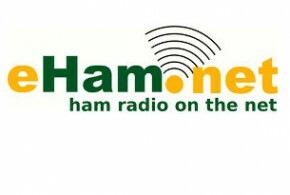 See what other hams are saying about us! 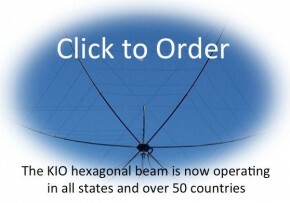 Order your KIO Hexagonal Beam Today! We accept PayPal, however you do not need a PayPal account to order!